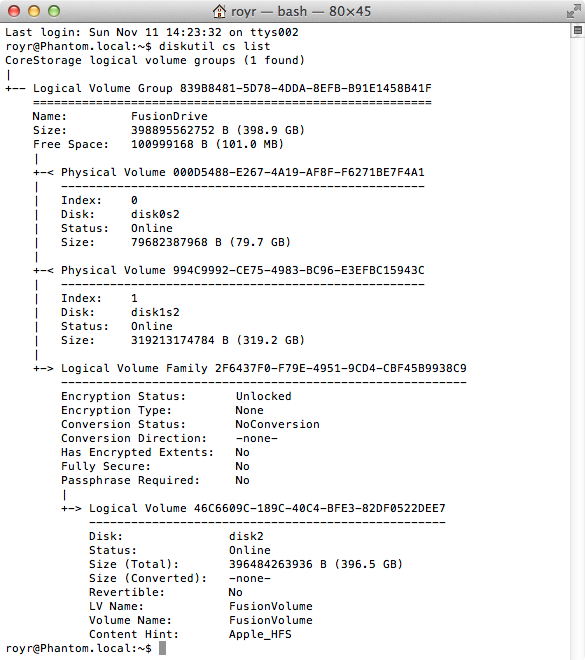 About 2 Weeks ago, Apple announced Fusion Drive in their new line of 2012 iMacs and Mac-Minis. The first thing I thought about after hearing about this, is that I'd like to try and incorporate the same ability in my 2009 Macbook Pro. For anybody willing to try this out, I should warn in advance that this is obviously unsupported by Apple, so beware since YMMV. Also, it's not quite certain yet if it behaves exactly as advertised. If you're anything like me, this warning means little to nothing to you, and you may want to go ahead anyway. A few weeks ago a dear friend (@avihut) left the company and the team I work at, In order to focus on his studies. When he left, I inherited his 2009 13 inch Macbook Pro. And an old and trusty beast it is. So when Apple came out with their announcement of the new Fusion Drive included with new iMacs and Mac-Minis, I was quite intrigued. This didn't seem like an hybrid drive, containing both Flash storage and spinning disks in the same piece of hardware. They said you could choose between 1TB and 3TB, which sounded to me like some implementation of a logical volume built out of one SSD and one HDD. But is it some kind of hardware RAID feature built into new iMacs? Nope. As blogger jollyjinx soon found out, this is a software feature of Mountain Lion (namely 10.8.2), and can be achieved on older Macs as well. He was so kind as to also post instructions and perform some tests. Turns out it's also block-level optimized, as opposed to file-level. Awesome! 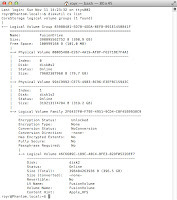 This means large files don't have to be copied wholly between physical drives, but specific more frequently accessed blocks in a file will be moved to the faster SSD for better performance. However, I have a Macbook Pro with room for only one drive. 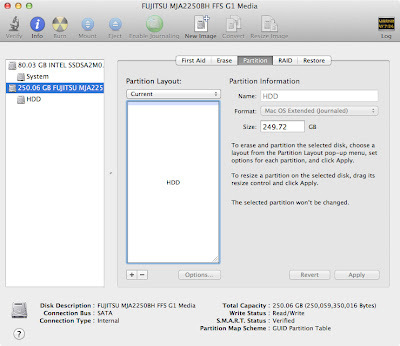 In order to create a Fusion Drive, you need two physical disks, and I wasn't about to walk around with a USB drive tethered to my MBP, slowing things down. The first objective was surprisingly easy to accomplish. The optical drive inside computers has become rather unnecessary in the last few years. We can do anything (including booting and installing stuff) either online, or with USB flash drives. A few companies picked up on that and are offering a kit to replace the optical drives in MBPs with another HDD bay. One of these products is named OptiBay but at 50$ it's quite pricey. You can also purchase an enclosure for your removed optical drive at 29$ more. Naaah, I'll go the Ebay way. I found one of many cheap OptiBay knock-offs for 10$ (I dub thee 'Fauxptibay'! ), and using iFixit's optical drive replacement instructions, I installed it along with my Mac's original 250GB* HDD in no time. * I ended up swapping this 250GB 5400rpm drive for a faster, larger 320GB 7200rpm drive. Since I already had an up-to-date TimeMachine backup, I opted for the second option. 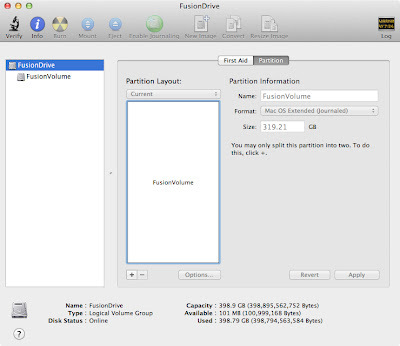 It's important to note that it seems you need a OS X 10.8.2 bootable USB installer in order to create the Fusion Drive, since older versions don't have that ability. Luckily, if you bought Mountain Lion from the Mac AppStore, the installer app gets updated automatically to 10.8.2 and you can create a 10.8.2 bootable USB version. Once I booted from the 10.8.2 USB installer, it was just a matter of firing up the Terminal, and following the instructions in jollyjinx's article. 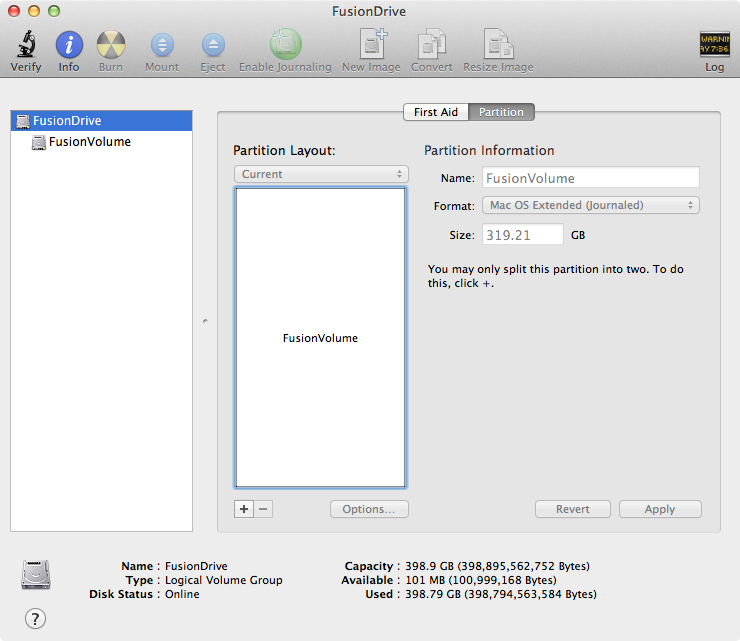 Using diskutil, I created a new Logical Volume Group, and within it created a new Logical Partition. When this was done, I quit Terminal, went back to the OS X installation, and chose my new Fusion Drive as the installation destination. Once the installation was finished (about 30 min incl. reboots), My fresh Mountain Lion installation came back up. I restored from Time Machine, and 30 min later I was back to my old setup - except now on Fusion Drive. Overall, this was pretty straight forward. I haven't tested performance yet, but hopefully this was worth it and I'll see some improvement soon. couldn't you install the ssd drive in the optical slot? Once the OptiBay was in place, I suppose I could. But in my case, I started the process with the SSD already installed in the regular disk slot. So, my old HDD went in the OptiBay. Another thing you should take into consideration is the bus speed. In newer MBPs, I think the disk slot SATA bus is SATA3, which could give you 6gbps. You probably want a disk that can take better advantage of the bandwidth, hence an SSD is probably a better choice for this slot. Also of note, if you're doing this specifically on a 17" MBP you must NOT use the superdrive bay for the SSD. 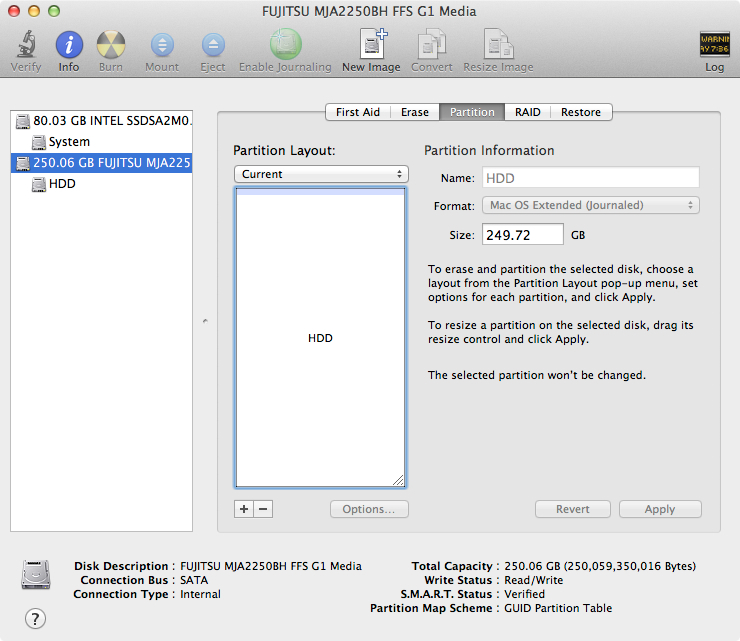 I have this setup on my late 2012 17" MBP using a 240GB SSD and 750GB 7200rpm HDD. As a "since you have it open and want to get the most out of it" FYI, you can install up to 16GB ram even though the limit is documented as 8GB max. The battery indicator for one seems unnecessary to me and the DVD super drive is bound to disappear. Guess we can expect those changes in a redesign later on.